A boil is a localized infection in the skin that begins as a reddened, tender area. Over time, the area becomes firm, hard, and increasingly tender. Eventually, the center of the boil softens and becomes filled with infection-fighting white blood cells from the bloodstream to eradicate the infection. This collection of white blood cells, bacteria, and proteins is known as pus. Finally, the pus “forms a head,” which can be surgically opened or may spontaneously drain out through the surface of the skin. Pus enclosed within tissue is referred to as an abscess. A boil is also referred to as a skin abscess. Boils can occur anywhere on the body, including the trunk, extremities, buttocks, or other areas. Furuncle or carbuncle: This is an abscess in the skin usually caused by the bacterium Staphylococcus aureus. A furuncle can have one or more openings onto the skin and may be associated with a fever or chills. The term furuncle is used to refer to a typical boil that occurs within a hair follicle. The term carbuncle is typically used to represent a larger abscess that involves a group of hair follicles and involves a larger area than a furuncle. A carbuncle can form a hardened lump that can be felt in the skin. The condition of having chronic, recurring boils is referred to as furunculosis or carbunculosis. Cystic acne: This is a type of abscess that is formed when oil ducts become clogged and infected. Cystic acne affects deeper skin tissue than the more superficial inflammation from common acne. 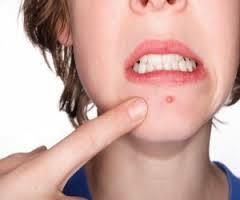 Cystic acne is most common on the face and typically occurs in the teenage years. Hidradenitis suppurativa: This is a condition in which there are multiple abscesses that form under the armpits and often in the groin area. These areas are a result of local inflammation of the sweat glands. This form of skin infection is difficult to treat with antibiotics alone and typically requires a surgical procedure to remove the involved sweat glands in order to stop the skin inflammation. What are risk factors for boils? Anyone can develop a boil. However, people with certain illnesses or who take certain medications that weaken the body’s immune system (the natural defense system against foreign materials or microbes) are more likely to develop boils. Illnesses that are associated with impaired immune systems include diabetes and kidney failure. Diseases in which there is inadequate antibody production (such as hypogammaglobulinemia) can increase the tendency to develop boils. Many medications can suppress the normal immune system and increase the risk of developing boils and other infections. These medications include cortisone medications (prednisone [Deltasone, Liquid Pred] andprednisolone [Pediapred Oral Liquid, Medrol]) and medications used forcancer chemotherapy. The skin around the boil becomes infected. It turns red, painful, warm, and swollen. You start running a fever. You have swollen lymph nodes. The skin around the boil turns red or red streaks appear. The boil does not drain. You have a heart murmur, diabetes, any problem with your immune system, or use immune suppressing drugs (for example, corticosteroids orchemotherapy) and you develop a boil. Boils usually do not need immediate emergency attention. However, if you are in poor health and you develop high fever and chills along with the infection, a trip to a hospital’s emergency room is needed. The diagnosis of a boil can be made by observation of the typical signs and symptoms. Blood tests or specialized laboratory tests are not required to make the diagnosis of a boil. If the infection within a boil has spread to deeper tissues or is extensive, cultures of the pus may be taken from the wound area to identify the precise type of bacteria responsible for the infection. This can guide the choice of antibiotics for treatment. Apply warm compresses and soak the boil in warm water. This will decrease the pain and help draw the pus to the surface. Once the boil comes to a head, it will burst with repeated soakings. This usually occurs within 10 days of its appearance. You can make a warm compress by soaking a wash cloth in warm water and squeezing out the excess moisture. When the boil starts draining, wash it with an antibacterial soap until all the pus is gone and clean with rubbing alcohol. Apply a medicated ointment (topical antibiotic) and a bandage. Continue to wash the infected area two to three times a day and to use warm compresses until the wound heals. Do not pop the boil with a needle. This could make the infection worse. If there are concerns about the seriousness of the infection, additional blood tests will be performed. The doctor may prescribe antibiotics if the infection is severe. If the boil is drained, a culture may be done to determine the type of bacteria causing the infection and to assess if an appropriate antibiotic was given.